The Grande Hall at Liberty Tower has a long and rich story that we feel honored to preserve and share for generations to come. Built in 1931 by the design firm, Schneck & Williams, the building was originally called the Mutual Home Savings Association building. Schneck & Williams were noted architects who also designed Orville Wright’s home, ‘Hawthorn Hill’, and The Engineers Club of Dayton. The building changed names to the Hulman Building in 1949, named after the Hulman family from Terre Haute. The Hulman’s were also famous for owning the Indianapolis Motor Speedway. Fast forward to 1998 when Liberty Savings Bank purchased and renamed the building to what it is known today, Liberty Tower. 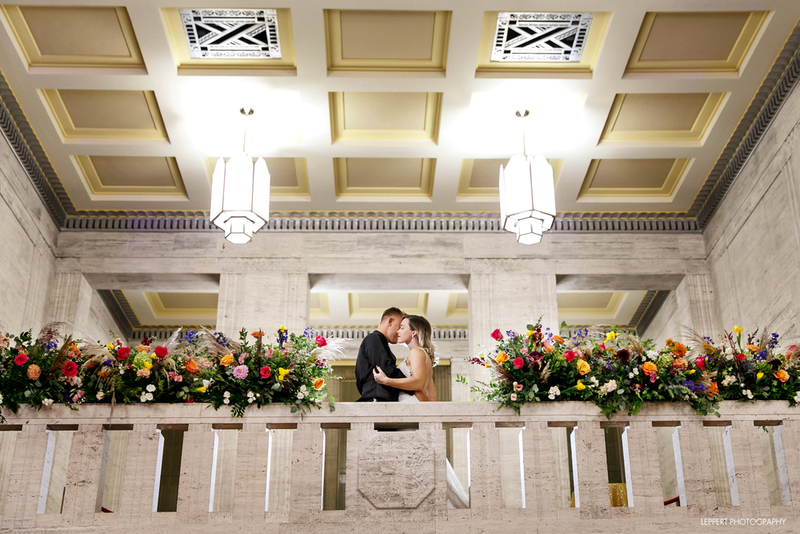 The Grande Hall at Liberty Tower is Dayton’s only example of Setback Art Deco architecture, which is evident in the setback “steps” that climb up the exterior of the building providing visual interest along its tall vertical lines. Other famous Setback Art Deco buildings include The Empire State Building, the Chrysler Building, and Rockefeller Center. In fact, Liberty Tower and The Empire State building opened the same year. During World War II, Liberty Tower was home to the Army Signal Core with offices in the lobby and as well as an observation deck on the roof. With Liberty Tower being the tallest building in Dayton at the time, the roof provided an ideal location to keep watch for air raids. They always had 2 watchmen on the roof 24 hours a day, 7 days a week. The building’s code name was ‘Dog Easy 77,’ which is now the namesake of the building’s signature cocktail. In the 1990’s the building went through a major renovation that actually uncovered many of the building’s beautiful features. Accoustic ceiling tile was taken down to uncover the stunning hand-painted Art Deco ceiling, drywall was removed revealing gorgeous walnut veneer walls and marble fireplaces that were walled over. The 1990’s renovation turned more into a preservation project that we are continuing today. We are preserving and re-purposing everything that we possibly can to stay true to our historic roots. Marble from the old bank teller stalls are being repurposed in the restrooms. Even old glass doorknobs found in building storage are getting new life on The Grande Hall’s doors. As the keepers of history, we take our responsibility to heart and look forward to the new stories that will take place within these walls. Liberty Tower is 295 feet high and is 23 floors tall. It was the tallest building in Dayton from 1931-1969. Liberty Tower had Dayton’s first underground parking garage that even included a filling station. Planning for the building started in 1929, and they broke ground in 1930. The tower only took 11 months to complete. The interior marble walls were transported all the way from Italy via a steamship, while the marble floors are from Tennessee. Long esteemed by architects and builders, Tennessee marble has been used in many notable buildings like the US Capitol Building, Grand Central Station and the National Gallery of Art. In 1982, Liberty Tower became listed on the National Register of Historic Places. The Grande Hall is thrilled to have partnered with Elite Catering and Events for all your catering, bartending and rental needs. 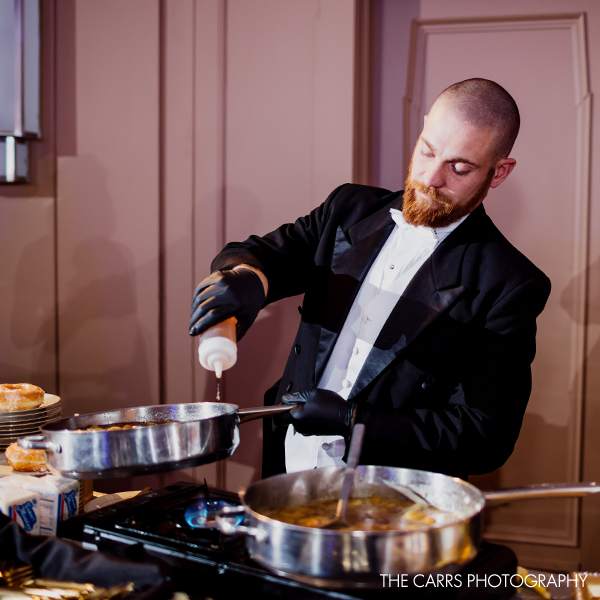 Whether it’s planning a networking breakfast, light luncheon or multiple course dinner, Elite Catering and Events is a full service event partner that will work with you every step of the way to create a delicious and memorable event! Believing that food is a focal point at any event, we’re known for our creative food displays that accentuate your event vibe and theme. Whether it’s ‘breakfast for dinner’ with our deviled eggs and candied bacon wall or a Mediterranean charcuterie display on our chalkboard table, we create moments your guests will remember. Entertain with confidence with our vast selection of delectable dishes. Using only the freshest ingredients, our menus can be customized to meet a variety of tastes and dietary needs. From American, Fusion, Italian, Seafood, Latin American, and Southern fare to buffets, passed dinners and chef stations, we work with you to craft the perfect menu for your event. Capture the flavor and fun of your event with the unexpected! From creative food pairings to interactive experiences, dining becomes entertainment. Ask about our strolling tables, pretzel walls, dessert bars, or one of our clients’ favorites…the Bananas Foster Donut Bar! HOw many hours of Event Time is included with rental? With the rental of The Grande Hall you get 5 hours of actual ‘event time’ with adequate set up and tear down time included outside of the 5 hours. Additional hours of ‘event time’ are available for purchase if needed. What spaces are included with rental? All spaces within The Grande Hall at Liberty Tower are included with your rental: The Grande Hall, Mezzanine Level, Dressing Suites, Director’s Room, Bank Vault and a few storage spaces. How many tables and chairs are included? The Grande Hall provides ample tables and chairs to cover the majority of what you would need for your event: (40)- 5ft round tables, (20+) 6ft and 8ft banquet tables, (5) tall bistro tables, and (300) beautiful Chiavari chairs. There are multiple parking solutions at The Grande Hall including valet parking, paid garage parking, and on street parking all readily available. We have partnered with the talented team at Elite Catering for venue showings, scheduling and for all your catering needs. If you have specific catering needs based on religious or cultural needs, we can work with you to ensure all of your catering concerns are met. Yes! You may bring in your own alcoholic beverages for hosted bars served by the caterer. If you are bringing your own alcohol, but still wish to serve our signature drink the ‘Dog Easy,’ please let us know in advance and we’ll make sure you have all the correct ingredients on your shopping list. When should we reserve The Grande Hall? Popular dates to book quickly so we recommend that as soon as you know your date and schedule a tour that you should reserve your event as soon as possible. We do not hold dates so only a signed contract with a retainer paid guarantees your reservation.